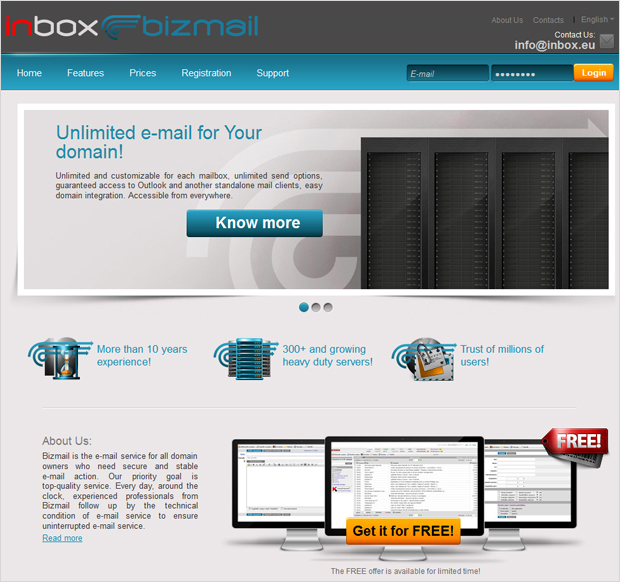 Inbox Bizmail – domain mail for everyone! At the end of this summer „Inbokss” LTD has officially launched a new product – Inbox Bizmail domain mail. This product, available at www.inbox.eu, offers a postal service for all owners of any domain. Simply put, if You’ve ever purchased or intend to purchase a domain name to create, for example, Your personal web page or website of your company (for example, www. Tavsdomains.lv), with Bizmail service You can easily start using Your own domain email (e.g., company@tavsdomains.lv). You must admit that when using an e-mail with a domain name for Your business contacts, You will look much better in the eyes of Your customers and partners. The process of creating a domain mail consists of 2 steps. The first thing You need to do is to complete registration, where You have to create access (e-mail) for the administrator. This e-mail further will be used to manage all domain e-mail. After registration You will be automatically redirected to the administration section, where You will see information about the next step. Validation is the second and final stage to create a domain address. You must confirm the ownership of the domain within 30 days after the registration. At this point You can use four different methods for the confirmation. These methods are easy even for the novice Internet users. Note that each method has its technical features; it is advised to choose the recommended validation methods. All “How and To” instructions will be sent to Your e-mail provided during the registration, as well as available in the Inbox Bizmail help section. Unless validation is completed, You can find discover almost all functionality of our products, except for sending and receiving emails, this including creation of new mailboxes, password settings, the distribution of rights among users, changes in the size, limits, and many others. Once You pass the validation, services of Your domain e-mail will be available in full. If you still have difficulties using Inbox Bizmail, each our member can receive free technical support via the feedback form or by e-mail info@inbox.eu. For those who have previously used the domain mail, Bizmail offers an easy and fast integration, after which You don’t have to waste Your own time on routine and endless work to support Your own mail service, software updates, and keep an endless struggle against viruses and spam. Inbox Bizmail – our offer for anyone who appreciates the time, reliability, and stability in the e-mail service! This entry was posted in About our products and tagged Inbox.eu. Bookmark the permalink.